This is an article about the Primer and paint basics written by TinBoat member Johnny. I want to thank Johnny for taking the time to put this together because this is one of those topics that comes up frequently. If you have additional questions, feel free to post them up on the forum. If you have a question, I’m sure a million other people do to. This is how Tin-boaters help each other out. Enjoy! Note: This article is not intended to teach bodywork, metalworking or making metal repairs. Disclaimer: All paints, primers, and coatings carry their own specific use and health warnings. Read and fully understand this information prior to using any potentially hazardous material. Also, REMOVING these coatings can be just as, or more hazardous if the dust is inhaled or ingested. Proper eye and respiratory protection is a must when using hand or power tools to remove existing paints, coatings, and surface contamination or your health could suffer dire consequences. Visit any automotive, aviation or boating forum and you can’t help but stumble upon the long-running debates as to which direct to metal product is better, self-etching primer, epoxy primer, anti-corrosive primer, etc. Then, the same debate over what topcoat paints and application methods will give the best results. You will hear all kinds of technical facts, personal experiences as well as flat out unsubstantiated opinions. Then throw in the thousands of products available for the job, each with their own recommendations, and you’ll find yourself quickly overwhelmed and it may seem impossible to choose what is right for your project at hand. After the smoke finally clears, the fact remains that most types of primers, paints, and coatings will give you successful results – if used correctly. The route you choose depends on the condition of the metal you’re starting with, the time you have to devote to the metal prep and paint process, your budget and a bit of personal experience and preference. Above all else, once you decide on your color, use that company’s paint products from the bare metal stage, through the primer stage to the final topcoat. Mixing products to save a few bucks could very well cause adhesion problems – thus producing less than a favorable finished project. Resulting in loss of time and money. There are a few schools of thought that need to be addressed prior to selecting a metal primer or enamel paint for your boat. #1 is how you want your final paint finish to look. Smooth, glossy and blemish free for that showroom look? If that is the case, then you must have at least some working knowledge and understanding of metalworking and repair prior to moving on to the painting stages. #2 PRIOR to doing any metal work on the hull of your boat, the surface must be properly prepared and all corrosion must be arrested completely. Reason being, that when a metal surface has corrosion on it, it is also in the pores of the metal. So, with this being understood, any hammering on the contaminated areas will only push the contamination INTO the metal pores and seal it shut. Then, when primed and painted over, this embedded contamination can and will proliferate, creep and grow under the primer just like skin cancer. Then, in time, the infamous bubbles and paint lifting will appear. This phenomenon will drive you crazy. Because, in your mind, you know you did all the right things to address the corrosion issues prior to applying the primer. Only to have it reappear like Lazarus from the Dead. So, prior to applying any primer ensure all substrates are clean and free from grease or oil. Use a degreasing solution to remove any contaminants and allow the surface to dry. After cleaning, remove all loose, flaking and scaling material by scraping with a paint scraper, wire brush or by sanding. For more stubborn issues, a more aggressive cleaning, chemical remover or grit blasting may be necessary. Then, clean again and again until the surface is free of contaminants. Rust and Corrosion is cancer to metals and paints….. Every effort must be taken to either arrest and/or remove it completely prior to hammering out defects and applying a primer. A clean, dry and properly prepared surface ensures that the finish paint applied to the primer adheres properly. 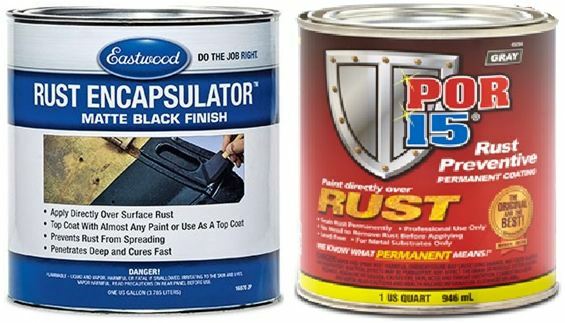 Even after a flawless cleaning, some contaminants such as rust and corrosion, can regenerate itself and migrate between the metal and the primer, thus affecting the adhesion of the top coatings applied to the primer that eventually leads to further problems, such as paint lifting and/or complete adhesion failure. #3 Only the proper preparation and priming can give you the long lasting protection and finish that we all look for and strive to achieve. Zinc Chromate:(yellow). Understanding the nature of this coating is an essential starting point for the discussion on anything concerning protective finishes and color coatings for anything constructed of aluminum or aluminum alloy.Note: yellow zinc chromate is not UV stable and must be top coated soon after application unless the project is undercover. 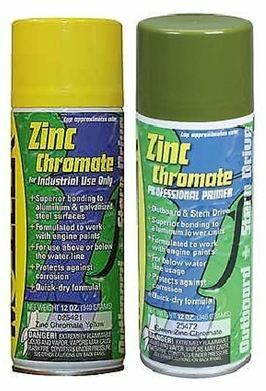 When properly applied, Zinc Chromate provides superior corrosion resistance. It is considered to be an excellent anti-corrosive barrier primer. It could be described as galvanizing that is painted onto bare metals. The term Zinc Chromate does not refer to a paint color, but rather a protective coating. Zinc Chromate alone is a corrosion resistant agent that is added to certain coatings. The Zinc Chromate mineral alone is HIGHLY TOXIC, thus protecting the surface from the proliferation of organic matter and provides superior corrosion resistance. The actual color of Yellow Zinc Chromate coating may vary from batch to batch or manufacturer to manufacturer without being viewed as an issue. Zinc Chromate: (green). Yellow Zinc Chromate in its raw form is not UV stable. Meaning, it will deteriorate under the sun’s Ultra Violet rays. If the Zinc Chromate is to be used as a topcoat for extended periods of outside use where it is exposed to high levels of UV, it is mixed with Lamp Black paste to give a bit more UV resistance and more durability in high wear areas. Mixing with black gives greener tones, which, depending on the amount of black added could run from apple greens to medium olive greens. Again, the actual color of Green Zinc Chromate coating may vary from batch to batch or manufacturer to manufacturer without being viewed as an issue. Read, understand and follow the manufacturer’s instructions for this product. or catalysts are required for the application, and applies right out of the can. pot life after being modified that will vary from brand to brand. Never pour modified material back into the original can. Epoxy Primers provide exceptional chemical and corrosion resistance and adhere directly to clean/rusty/galvanized metal, aluminum, painted surfaces, etc. Read, understand and follow the manufacturer’s instructions. Self Etching: Is a DTM Primer, which is a “Direct to Metal” application that chemically etches and primes bare metal that is free of rust and corrosion in one step. Self Etching primers use an aggressive solvent to assure excellent adhesion to properly prepared bare metal surfaces. Exercise care when using this product over or near previously painted finishes as lifting may occur. 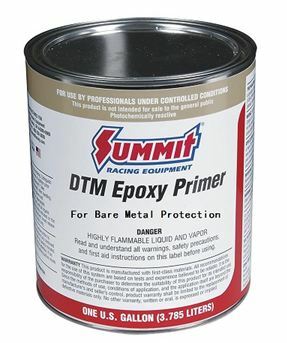 DTM is designed for bare metal which may have body filler repairs without any adverse problems. It can tunnel or burrow under existing paint or sealant and create a path for rust or corrosion to break the bond, so it is not designed to use over existing coatings regardless of how sound they may be. DTM also adheres exceptionally well to bare steel, aluminum, stainless steel, and galvanized metals and is compatible with virtually any paint or finish that is applied over it. A self-etching formula bonds better to bare metals than any other primers. It is also a 1K single stage formula which requires no catalyst. Read, understand and follow the manufacturer’s instructions for this product. Red Iron Oxide: Working with Red Oxide Primer is not difficult, but it helps to be aware of some safety precautions and application tips. A brush or a short pile roller is the easiest tool for application. Thinning is not normally required if applying with a brush or roller. Red Oxide Primer is intended for use on exterior ferrous metal and is not usually suitable for galvanized or nonferrous metals such as aluminum, copper or brass. Ferrous refers to metals that contain iron. If you’re uncertain whether your metal is ferrous or nonferrous, use a magnet to test it. Ferrous metals are magnetic, and nonferrous metals are not. Red Oxide Primer is an anti-corrosion coating designed to stop rust formation. It can be applied directly over a rusty surface and is most ideal for exterior use. Red Oxide Primer can be covered with most conventional topcoats once it fully dries. Use at least two coats of Red Oxide Primer to provide an adequate base coat to your metal. Each coat will be dry to the touch in about 2 hours, but not fully cured for about 6 hours. Red oxide primer will not be ready for an overcoat until it dries for at least 24 hours. Low temperatures and high humidity can impede this time. Red Oxide Primer is not recommended as a coating alone and should be top coated. Always check the manufacturer’s label for specific instructions on application, drying and re-coat times. Acrylic Latex Aluminum Primer: Water-based primer formulated for use on properly prepared aluminum and galvanized metal. This type of Primer is lead-free and cleans up with soap and water. Once properly applied, provides a strong bond between the substrate and finish coatings. This is a very user-friendly product making it unnecessary to remove all existing primers and paints as long as they are sound and not flaking. Once dry, this primer cannot be successfully sanded to a smooth finish. So if you envision a smooth glossy surface, select another primer that is sandable to achieve your desired finish. Carefully take into consideration the inherent properties of each primer and coating that you will be working with. Encapsulators: A urethane based product formulated to penetrate, absorb, surround and encapsulate rust and corrosion making it one inert substance that is stable and non-proliferating, meaning that the rust or corrosion will not continue to spread, completely blocking out moisture and oxygen which is required for further growth. Once applied and cured, it is impossible to remove with anything short of media blasting. Once fully cured, it is impervious to most acids and chemical removers. POR-15 and Eastwood are only a couple of brands of urethane-based primers, encapsulators, and topcoats. Each brand carries its own inherent qualities, protective measures and application methods. Urethane Rust Preventive Coating is a high-performance coating designed for application directly to rusted or corroded metal surfaces and will stop rust and corrosion permanently. Encapsulating Coating is non-porous and seals and protects many surfaces from water, chemicals, salt, and other corrosive elements and is designed to be painted directly onto rust and corrosion. Urethane Encapsulating Coating is a very effective Anti-corrosive and rust preventive coating that offers superior chemical resistance due to its dense, cross-linked molecular composition and non-porous attributes. The secret lies in the coating’s curing process. Most paints dry through evaporation, but this coating “cures” through a chemical process activated when moisture in the air is present. It has the opposite chemistry of ordinary paints. Now, this incredibly hard, tough and flexible coating can be made even better by adding a layer of fiberglass cloth to the first coat while it is still tacky to the touch and you have a reinforced coating that is practically indestructible. With some knowledge, it can be used to reinforce rusted out floor pans in old cars, such as a 1960 Volkswagen Beetle. 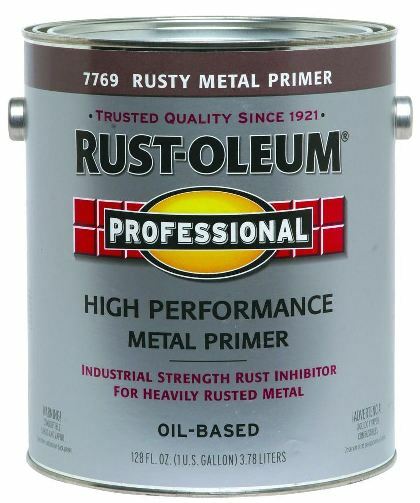 This is probably one of the best rust and corrosion arrestors on the market. But, it is also probably the most expensive at $33.00 a pint. Of all the coatings available, this one requires the most education for its use. Once the can is opened and moist air enters the can, the pot life is ignited and must be used up within the quickest time possible or it will congeal in the can within a week or two. Pour only the amount needed for the job into a separate cup and close the can quickly. Be very careful to remove every trace from the lid rim or the lid will be permanently bonded to the can, Do not pour unused material back into the original can. If this material gets on your skin, it is NOT removable – it has to wear off. Read, understand and follow the manufacturers instructions on this product. Rust converters: Is a Metal Treatment – NOT A PAINT. It should not be confused with any type of primer, paint, or coating. Most Rust Converters are water based and relatively inexpensive. Being water based, it will not be effective on any surface that is contaminated with oil, grease or other contaminants on the surface. They do more than simply neutralize rust and corrosion. They chemically combine with the rust and corrosive molecules to build a black, inert layer that is suitable for painting. This conceals the presence of rust and corrosion and delays further deterioration of the metal. Different objects can benefit from rust converters—from steel items to old rusty iron. It will neutralize rust and corrosion on various types of materials such as steel, iron, copper, and aluminum for up to 10 years on some projects. Again, this product is for bare metal treatment only. It will not work on previously painted surfaces. Again, the surface metal must be cleaned as thoroughly as possible and as much loose rust and corrosion must be removed by mechanical means such as wire brushing or scraping prior to using a Rust Converter. Proper eye and respiratory protection is a must when working with any acids. 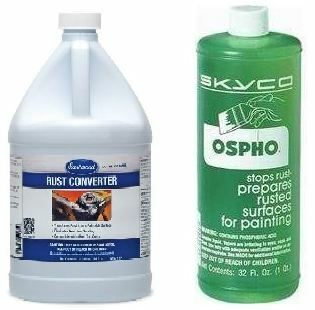 Some brand names of Rust Converters are OSPHO, Eastwood, Rust-Oleum, Rust Bullet, Naval Jelly, etc. and Dichromate. Both of which carry their own safety advisories. Read, understand and follow the manufacturer’s instructions for best results. The information and representative photos in this article have been compiled from various sources found on the World Wide Web. They have been edited to provide useful information to the Tin Boat owners. It is in no way meant to be the final answer to any problem or issue you may have. Read, understand and follow all the instructions and warnings on any product you may use. It is the users responsibility to adhere to all safety precautions used in normal metal and woodworking functions as well as the applications of any chemicals, primers, cleaners, or paints. Very informative and easy to understand. Thank you for sharing. Thank you for this article. Researching can be a bit dizzying…especially for a novice like me. 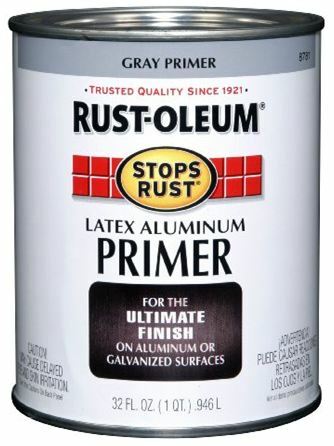 I was wondering if you have an opinion on Rust-Oleum’s spray can “Aluminum Primer.” I’ve been looking for some information or reviews but have found very little. Thanks in advance. Unfortunately, I have not used the rattle can Aluminum Primer recently. But, when I used it a few years ago when it first came out, it worked as it should. I mainly use the brush on alum. primer with great results. Either one will work good for you.